Have you seen the fancy new photos on my homepage? It’s been awhile since I last posted, so I’d like to bring everyone up to date with what’s going on. A couple of weeks ago I asked my friend if she would be willing to take some nice photos for me and she said yes! We got some wonderful photos which now grace my homepage. I’d been wanting to get some different photos for awhile, and I love how clean they are! Since they were taken on the same day and in the same general area, they go well together. They look so professional, and I’m so glad my friend took them! 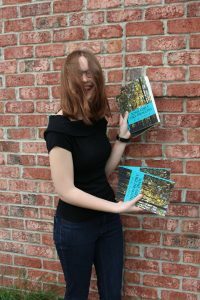 We had a lot of fun posing, figuring out how to hold the books, finding fun backgrounds with good lighting, and dodging the wind so we wouldn’t mess up the pictures. It was a windy day (as demonstrated by the photo to the right), but bright and sunny. Monday the 15th I sent Phoenix over to the editor. I’m focusing on getting the cover and description ready before I get Phoenix back, but as it’s the end of the school year everything is due all at once so we’ll see what I can do. I expect to get Phoenix back in the next couple of days and will keep you posted on how the final draft and formatting comes along. I have a couple of big author events coming up that I’ll be announcing soon, as well as the release date for Phoenix. We’re still looking at mid-August for the book release and are working on getting a book signing planned. I’m super excited about everything that’s coming up, so check back here often to stay up to date with everything that’s going on.